Eniola Aluko could return to the England women's team after interim head coach Mo Marley said she would "100%" consider picking the striker. The Chelsea forward, who has not played for England since April 2016, has been in a dispute with the Football Association over racial discrimination. 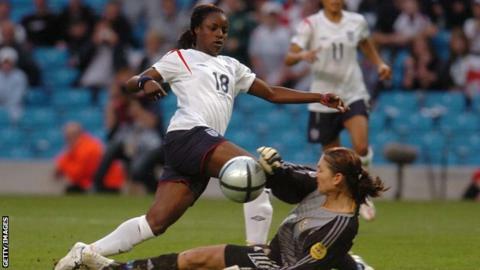 On Wednesday, the FA apologised for comments made to Aluko by former England women's manager Mark Sampson. Marley said: "It's for me to find players in form, playing well." Marley, 50, succeeded Sampson, who was sacked, on 29 September and will oversee a friendly against France on Friday, followed by World Cup qualifiers against Bosnia-Herzegovina and Kazakhstan in November. Asked if 30-year-old Aluko, who has scored 33 goals in 102 international caps, would have a way back into the set-up, she told Sky Sports: "While I'm the manager, 100%. "We've had all the talent reporters out assessing everybody. It's for me to find the players who can help us get to the World Cup and get from number three in the world to number one." Aluko's complaint - made in 2016 - saw her accuse Sampson of belittling her, making racist remarks to both her and a team-mate. Sampson was cleared in March 2017 but the investigation was re-opened in September in light of new evidence. On Wednesday, FA chairman Greg Clarke and chief executive Martin Glenn answered questions at a hearing in parliament, prompting MP Damian Collins to state their handling of the investigation has cast "serious doubt" over their positions. Marley admits the controversy has proven "really difficult" for her squad to deal with in the build-up to their meeting with France. Aluko was joint top scorer in qualifying for the 2015 World Cup, and helped England to the bronze medal at the tournament. During her time out of the international set-up, Aluko was top scorer in the 2016 Women's Super League and claimed the title with Chelsea in 2017. She was also critical of England's players for running to celebrate with Sampson after a goal in their 6-0 win over Russia in September, tweeting: "For the most together team in the world tonight's 'message' only shows a level of disrespect that represents division and selfish action." You can now add WSL 1 notifications for line-ups, goals, kick-off, half-time and results in the BBC Sport app. Visit this page to find out how to sign-up.